It is optimized for programming in general, and perl in particular. 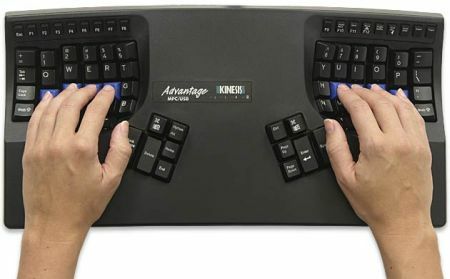 It is designed specificaly for use on a programmable Kinesys Contoured keyboard. It is running on Mac OSX only (so far). Svorak R1 is the result of a slow mutation process applied to the Licket version of Svorak. 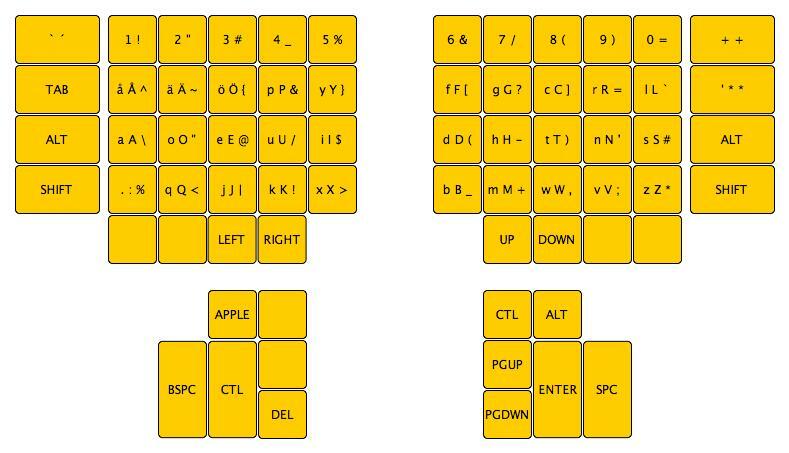 My aim in developing it has been to place all the signs required in standard unix programming (shell, perl, C...) under the same keys as usual letters, while making them available via the alt modifier key conveniently re-located to both side of the keyboard, just above the shift modifier. I took special care in placing all the signs required for Perl programming at the most convenient locations, on the home row and above. On each key icon, the first sign is what you get by pressing the key without modifier, the second sign is the result of shift+key, the third sign is the result of alt+key. Some keys on the lower row are unassigned. Notice the convenient location of the shift and alt keys on both sides of the keyboard, easily reachable with both your pinkies. Download this osx keyboard file and copy it under "/Library/Keyboard Layouts". Open the system preferences window, go to 'International', then 'Input menu' and scroll down until you find 'Svorak R1'. Select it. Select also the 'Show input menu in menu bar' option. Logout and login again. You should now be able to select 'svorak r1' with the keyboard icon on the upper menu bar. (Note that '+' does not refer to the '+' key. It only shows you which key to press next).